A while back, Epson contacted me about working together. They had this wide format printer that, frankly, sounded really awesome. The Epson SureColor P400 printed up to 13 x 19 inches in size, and on all these really great mediums. These mediums included various art papers, photographic papers, and even canvas. Whaaaa???? So you’re saying I can print big stuff on any variety of mediums? SOLD!! The Epson SureColor P400 wide format printer arrived, and the sucker was huge. It’s so big that it needed its own desk in my office. Once I got it set up, I tried it out. And it printed beautiful pictures. I was so excited, I immediately started sharing pictures of my prints on social media, and the wheels in my brain started churning overtime..
Now, up to this point, I’d only printed standard 8 x 10 prints. Once I started to print 13 x 19 images, we ran into issues. Serious issues. There were constant paper jams. Ink dumped out. Every time I tried to print, the printer would do a nozzle check, which basically sprayed ink all over the inside of the printer. No Bueno. On the off chance I could get a 13 x 19 image to print, it would be like half of the image. This was becoming really frustrating, and I just kept thinking that this shouldn’t be this difficult. While I wanted to love this printer, all I got were negative vibes from it. Finally, I was able to get connected with the right department at Epson. They were shocked at the issues I was having, and after much troubleshooting, we determined that the printer I had was faulty. I received a replacement Epson SureColor P400 printer, and tested it out. It printed! It printed small format. It printed large format. It didn’t spray ink all over everything when I tried printing. Dare I say we had success? Using the replacement SureColor P400 printer is such a great experience that I want to print all the things. And I often do! Currently, we’re working on a series of printables that will look amazing at 11 x 17 inches or 8 x 10 inches. This is a serious printer that is affordable. If you’re the family archivist, you’ll want to consider one of these bad boys. With the increase in digital photography, we’re losing the prints we had. I know more than one person who has lost their precious photos when their phone was lost, or their computer fried. If you’re an artist, this is also a good option for you. You can produce your own prints, and have total control over them. The printer will pay for itself in no time. The color output is amazing. Except for one image, where the print head nozzles needed to be cleaned, everything has been crisp, vibrant, and full of amazing color. The printer can print, in full color, any size from 8×10 inches to 13×19 inches. The specs say you can print as small as 4×6 inches, but due to the way the paper loads, I personally wouldn’t try it. You can print panoramic photos. By using one of the rolls of paper, you can print as wide as the roll (8 ½ inches or 13 inches) x as long as the roll (roughly 10 meters). You can print on a wide variety of materials. You can use just about any kind of paper in this printer, from 20 lb bond, which is regular copy paper, to presentation papers to photo paper to the fancy stuff. There are a lot of papers that come in 13 x 19 size, too, like Ultra Premium Photo Paper in various finishes, Velvet Fine Art Paper, Exhibition Watercolor Paper, and the Cold Press papers. I’ve even printed actual fabric with the Epson SureColor P400. 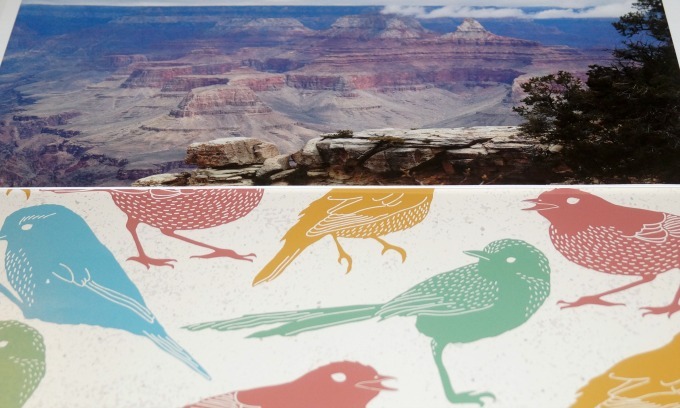 This photo of the Grand Canyon is printed on Exhibition Watercolor Paper Textured. 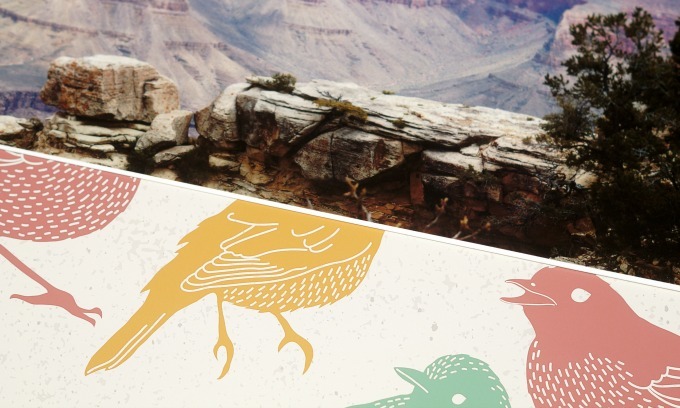 The birds print above is printed on Ultra Premium Photo Paper Luster. 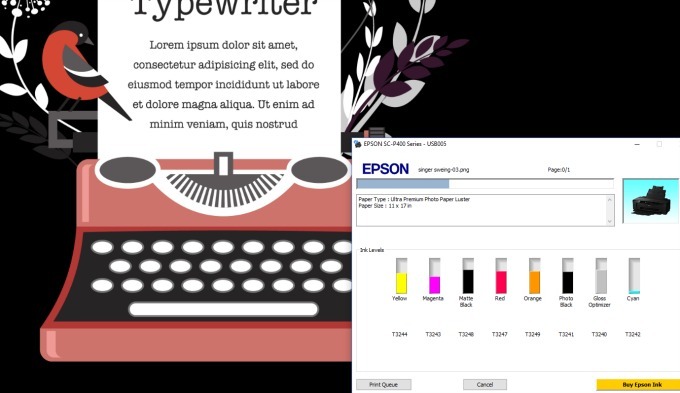 The ink used in the Epson SureColor P400 printer is archival quality and fade resistant. It will last 100+ years in regular conditions and 300+ years in dark storage. That’s about as good as it gets. It supports roll papers and mediums. There are 8 inch and 13 inch wide rolls of photograph paper available, as well as several types of canvas. You can print as wide as the roll x as long as the roll using these materials. 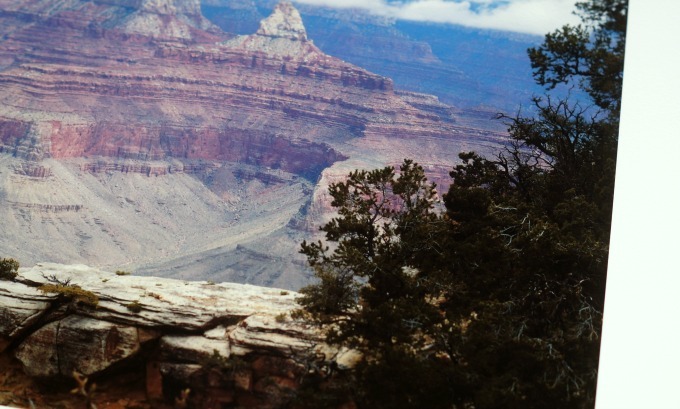 Make your own banner or print those amazing panoramic photos. There are 8 ink cartridges in the printer. This is great, as you only need to replace what you need. It’s also how the printer produces such crisp, vivid photos. 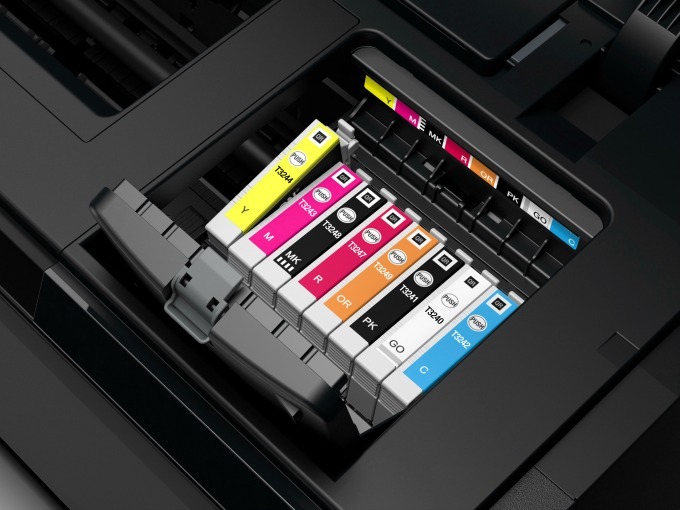 A little tip – only replace the cartridge WHEN it needs to be replaced, and won’t let you print any more. I have one that’s telling me to replace it, but it still lets me print, and doesn’t affect quality. The printer does have a gloss optimizer, which helps create such amazing prints. It goes through that like crazy, and I haven’t been able to find away to turn it off. I haven’t found a way to decrease the print quality. Not every print needs to be at a bajillion dpi, especially on a highly textured paper, a thin medium, or on canvas. 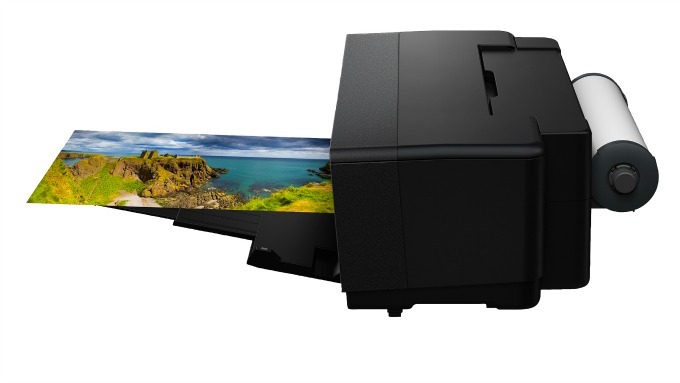 The Epson SureColor P400 Wide Format Printer prints fairly quickly. It takes 2-3 minutes per 13 x 19 inch print, and another minute or so to load the paper. 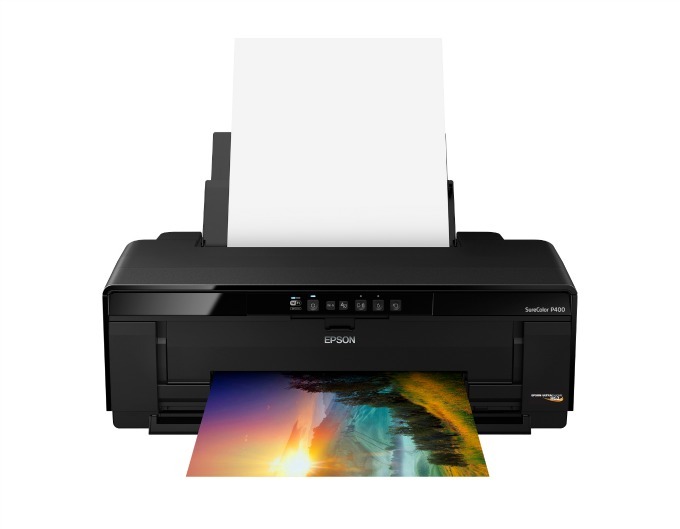 To sum it up, if you’re a photographer, a visual artist, or the family archivist, you’ll want an Epson SureColor P400 wide format printer. If you travel a lot, you may also want to consider investing in one to print your travel photos. It’s not inexpensive, but the awesomeness that exudes makes it worth the price tag.